The TV-B-Gone kit is what you need! This ultra-high-power version of the popular TV-B-Gone is fun to make and even more fun to use. 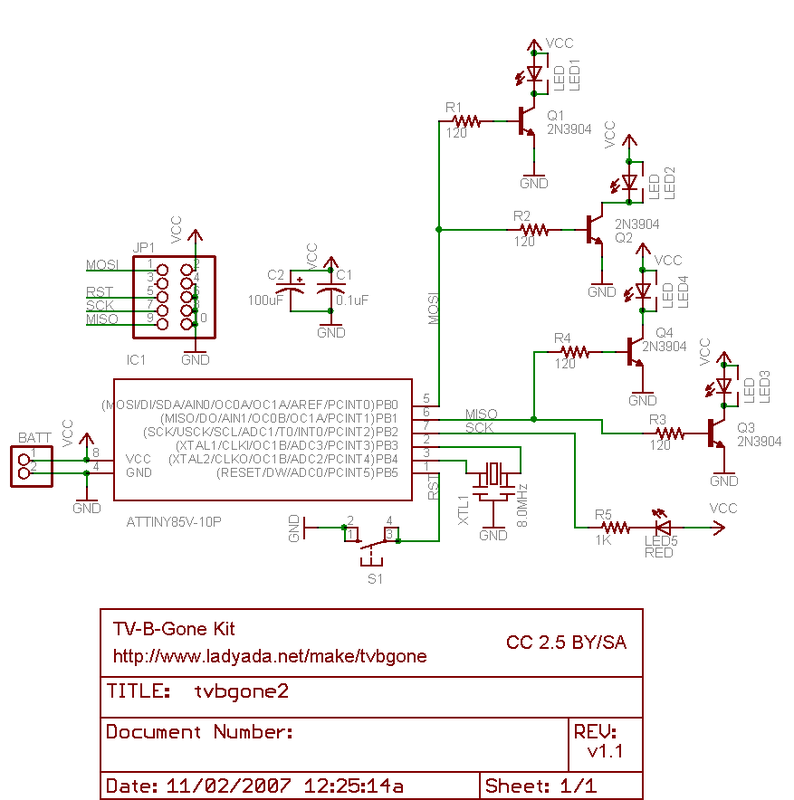 Built in co-operation with Mitch Altman (the inventor of the TV-B-Gone - http://www.tvbgone.com) this kit is a great way to build something truly useful! What is a TV-B-Gone Kit? TV-B-Gone http://www.tvbgone.com/ is a 'universal' remote control device, it is basically like a remote control but with only the "Power" button. This is a kit version of that product. How are the kit and original TV-B-Gone product related? Mitch Altman http://www.pbs.org/mediashift/2006/04/digging_deepertvbgone_device_s.html (inventor of the TV-B-Gone) and his company Cornfield Electronics http://www.cornfieldelectronics.com/ worked together with me (Adafruit Industries) to develop a kit version of the TV-B-Gone. Mitch thinks open source kits are awesome! Why should I get a kit if I can just buy a TV-B-Gone ready made? This kit is for learning how to solder and maybe even a little of how remote controls are designed. The kit version also has 2 AA batteries and 4 high power output IR LEDs to allow for much longer distances than the keychain product, more than 100 ft! It's also easier to hack and adapt for other projects. However, the kit has fewer codes (so there may find a TV once in a while that doesn't respond), is larger and heavier and requires you to put it together. I suggest you get one of each! Does this kit work on all TVs? We picked the 46 most common codes for North American/Asian TV's to program into the kit. However, we couldn't include every code. Field testing has shown that nearly every TV we encountered would turn off, even the most recent LCD and Plasma flat screen TVs! Note that this kit will not work with LED signs, computer monitors (that are not also televisions) and display signs that don't have a remote-control port. What do you mean N. America/Asia? Does this kit work with European TVs? How close do I have to be for the TV-B-Gone kit to work? The closer the better, but we've found that if you have pretty good aim, you can be 100' (30m) or farther. I'm not able to turn off the TV from more than 30 feet away, what's wrong? First, perform the test to make sure all 4 IR LEDs are firing. Finally, try many different TVs. Some TVs simply do not respond as well from far away as others. I want more range! How can I make the kit more powerful? You can swap out the 2 AA battery holder for a 3 AA battery holder. This will give even better performance! Using C or D cell batteries will give longer run time but won't increase the power. Do not use 9V batteries or more than 3 1.5V alkaline batteries, you can permanently damage the kit! Soldering iron. One with temperature control and a stand is best. A conical or small 'screwdriver' tip is good, almost all irons come with one of these. Solder. Rosin core, 60/40. Good solder is a good thing. Bad solder leads to bridging and cold solder joints which can be tough to find. Dont buy a tiny amount, you'll run out when you least expect it. A half pound spool is a minimum. Multimeter/Oscilloscope. A meter is helpful to check voltages and continuity. 'Handy Hands' with Magnifying Glass. Not absolutely necessary but will make things go much much faster. Check out my recommendations and where to buy. Check to make sure your kit comes with the following parts.Sometimes we make mistakes so double check everything and email support@adafruit.com if you need replacements! Description : 8.00 MHz ceramic oscillator. It might also be blue. Description : Narrow beam IR LED. These have a blue-ish tint. Note that the microcontroller must be programmed with the v1.1 firmware. 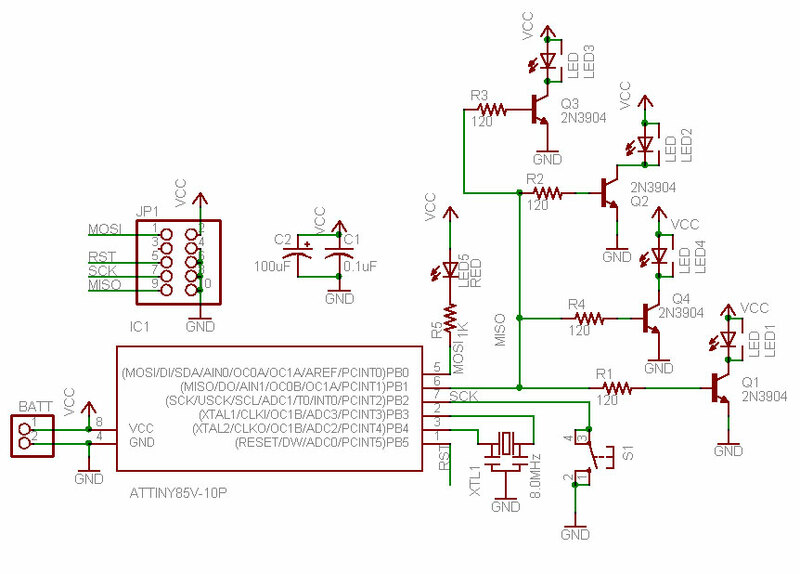 Any NPN transistor that is pin-compatible with the 3904 should be OK. Note that the microcontroller must be programmed with the firmware. Put the printed circuit board into a vise or board holder, heat up your soldering iron and make sure you're ready to go! The first part we're going to assemble is the button. The button is a symmetric part so it can go in two ways. Line up the metal legs with the holes in the circuit board and snap it in. The button should sit flat against the circuit board. Using your soldering iron, heat up a leg of the button and the poke solder into it to make a nice solder joint. Repeat for all four legs. The solder points should be clean and shiny. See the tutorials for soldering help if you can't get it right. Next is the 1.0 kilo ohm resistor R5. This is the brown-black-red striped part. This resistor sets the brightness of the little indicator LED. Resistors are symmetric, so it can go in either way. Bend the legs so it looks like a staple and insert it into the R5 location as shown. Then bend the legs out a bit so that when you turn the PCB over the part doesn't fall out. Use the diagonal cutters to clip off the resistor legs so that only the solder points remain. Now its time to place the small indicator LED LED5. LED's are not symmetric and must be placed correctly in order to work. You'll notice one leg of the LED is longer than the other. This is the positive leg. The positive leg goes into the hole with a + next to it. In the picture shown, its the left hole. Insert the LED into the correct location, and bend the leads out to keep it from falling out when you turn the PCB over. Turn the PCB over and solder both leads of the LED. Clip both leads off the LED. The next part is the ceramic capacitor C1. Ceramic capacitors are symmetric so it can go in either way. Next, place 2 components. The ceramic oscillator and the 8-pin socket. The oscillator has 3 pins and is symmetric. The oscillator is the timeclock for the microcontroller, making sure that it is performing its functions at the correct speed. The socket is for protecting the chip and making it easy to insert and remove. The socket has a little notch in one end. That notch should match the one in the picture silkscreened onto the circuit board. This will help you place the microcontroller in properly later. Solder the rest of the points then clip short the legs of the oscillator. Use your soldering iron to 'tin' the wire, melting solder into it to keep the wire from fraying. Insert the wires into the PCB so that the red wire goes to the + hole and the black wire goes to the - hole. Solder the wires, then clip them if they're too long. Carefully insert the microcontroller into the socket. Make sure that the little dot (and triangle) are at the end with the notch in the socket. In this photo, the dot is on the left. The microcontroller is the device that stores all the codes and turns the LEDs on and off according to a program. Test the kit now by putting two good AA batteries into the holder and pressing the button. The green indicator light should blink to show that the microcontroller is functioning properly. If you don't get a blinking light check the batteries, make sure the indicator LED is in correctly,and that the chip is in the right way. Once you've verified it's working, remove the batteries. Next place the 4 47 ohm resistors, R1 R2 R3 R4. These are the parts that determine how bright the IR LEDs are. Solder and clip all 4 resistors. Bend the capacitor so it lies over the resistors, this will make it stick out less. Next are the four transistors Q1 Q2 Q3 and Q4. These are the devices that turn on and off the high power IR LEDs. The microcontroller doesn't have the capability to provide a lot of power directly to the LEDs so these transistors assist it. Transistors have three pins. bend the middle pin back a little and insert it so that the rounded and flattened sides match up with the picture silkscreened onto the circuit board, as shown. The transistor won't be able to sit flat against the circuit board, so just make it poke up a few millimeters. Turn the PCB over and solder in all the transistors. Then clip the wires. Next is the IR LEDs. Start with LED1, a clear IR led. Like the small indicator LED, it has polarity. Make sure the longer, positive lead is on the right, as shown. Place the remaining LEDs. The blue tinted ones should go in the center. Make sure they are in the correct orientation! Solder the LEDs in and clip the long leads. You're done soldering! Now you may want to perform some tests to make sure its working. Visit the Testing page for more info. Digital cameras can detect infra-red light but our eyes can't. Use a digital camera, webcam or camcorder and look through the digital viewfinder at the IR LEDs, after pressing the button, the LEDs should flash. 1. Simply point the device as best you can so that the Infrared LEDs are aimed at the television you'd like to turn off. 2. Press the button once. Don't hold the button down! It will just keep resetting itself. The codes start to transmit once you release the button. 3. The indicator LED will blink for every code it sends. Keep the TV-B-Gone pointed at your target until it turns off. The 4 infrared LEDs will not blink visibly because human eyes can't see infrared light. 4. When the TV-B-Gone is finished, the indicator light will blink quickly a few times and then stop. The most popular codes are at the beginning, less common codes are at the end of the list. Wow. Great instructable. Couldnt you increase the range if you used infa-red lazers instead? you might have to use a scope or magnifying device aligned with it to work since it is a lazer point, but it might work up to 1000 feet, depending on the lazer and power source. I was thinking the same thing. If you got an IR laser diode it would actually put out a wide beam, not a dot, so long as you left off the focusing lens. So your aim would only have to be approximate. But the greatest trouble I'm seeing is that I don't know how much voltage is being put into the LEDs. So replacing the LEDs with a laser diode would be difficult because you would need to incorporate a driver circuit between the output of the original circuit and your laser diode without hindering the information the original circuit is trying to pass on. Would anyone know how much this circuit puts out? I think this circuit's output is about 1,9 volts, because the infrared LED comsumes max 1,9 volts. Yeah IR laser is a good idea... By the way, do you know how to program the microcontroller (ATTINY85V-10PU). i already have the source code, but i cant upload it to the microcontroller. Regrettably I do not. I haven't learned how to do that yet. I'm still kinda new to all this. But I'm learning. I think I'm learning fast, but that has yet to be seen. Sorry I can't help anymore. I hope it works well for you. That's actually pretty cool. What did you use to cut it? What is the flat surface like? smooth or rough? I'm assuming smooth is better? I'm sure I could learn through trial and error but I'd rather just let you tell me. As Benjamin Franklin said, "Experience is a hard master, but fools will have none other." Meaning if someone else can tell you how to do it, or someone else has already told you it's a bad idea, and you want to find out your own way, you could be a little smarter. So as I said, I'll just let you tell me. That is if you don't mind, of course. All help is welcome. Thank you. I'm from texas. It's nice to talk with you also. If you want it smoother you should try taking baking soda and mixing it with water until it is a paste (toothpaste with baking soda in it works fine too). Then you use a brush(tooth brush or anything else) to rub the paste on the surface you want polished. It also works very well on aluminum foil to make a reflector. But the aluminum foil warps so you have to do one side until it's the way you want it and then smooth it out, or polish the other side until it's flat again. I think that should help with the clouded problem. I'd be interested to know how that turns out. What type of saw did you use to cut it? You're welcome. Let me know if it works. So a hand saw with a metal cutting blade? yea, a small hand saw with a metal cutting blade... have you ever made some instructables yet? I understand. What's faster? Cutting it with a saw, or filing it?I kinda made an LED cube. Mine looks like junk, but I was able to entirely conceal the switch, and I made the batteries replaceable, so I'm happy with it. And I've been trying to build a laser, combining multiple instructables, and adding my own tweaks. The last part came in yesterday. I'm happy. How about you? Have you built any instructables? what things have you ever build?? I think I'll build the coil handgun after the laser, actually. I tried to make a stun gun once, the switch I used wasn't rated for the voltage and it melted the leads together and was useless, But I fabricated a pretty cool housing out of PVC for it. and I made a "lightsaber". That worked really well. I used it for a halloween costume. It was pretty sweet. And I know it is completely un-manly, but I knit. I've made some pretty cool stuff doing that. I'm sure I've done more, but I can't think of anything right now. Are you working on any projects now? That's so cool. You should make an instructable so I can make one too. I was wanting to make a multi stage coil gun, but I was thinking more along the lines of a rifle configuration. I don't know how expensive it would actually be. I thnk I've found a way to use a single charge circuit and to increase both the voltage and capacitance. Of course it would need one charge circuit and set of capacitors per stage, but it should be really cool when it's all said and done. Plus I think I found a way to make explosive rounds. So destroying anything and everything should be pretty easy. I'll have to see how they work when I've finished my coil gun. They would take about the same, maybe more. It would be a simple mod.